With excruciating pain and the vomiting of blood, antral ulcer symptoms can lead to a life-threatening condition. An antral ulcer occurs in the lower abdominal region and is not to be confused with the more common condition known as a peptic ulcer, which also develops in the stomach. However, many peptic ulcer cases can develop into antral ulcer lesions as the two conditions share the same symptoms. We will learn about the various antral ulcer causes, possible complications of this condition, and the best antral ulcer treatment to follow. Before we get into the antral ulcer definition, you are probably already wondering, “What does antral mean?” The term “antral” refers to the pyloric antrum located near the bottom of the stomach. It is the region that connects the stomach to the first part of the small intestine, known as the duodenum. An antral ulcer is an open wound that forms within the lining of the lower stomach. These lesions happen when the mucous membrane of the stomach becomes weak and thin. The membrane protects the tissues in the stomach lining from harsh digestive juices. Under normal circumstances, the acidity of these digestive juices remains at an acceptable level. If this level increases due to bacteria or other harmful substances, it can cause the lining to become thin or destroyed. Further damage to the lining due to inflammation can cause the sore to develop into an open ulcer, with severe symptoms leading to hemorrhaging and death. An antral ulcer is a form of peptic ulcer as it is concentrated in the stomach lining. An antral ulcer is also known as an antral gastric ulcer. An opening or sore in the stomach lining can be attributed to the stomach’s reaction to internal and external factors. These affect the normal digestive acids that our stomach uses to break down ingested foods. Known as H. pylori, helicobacter pylori is a bacteria found in the protective lining of the stomach. This infection occurs due to ingesting contaminated food and beverages, especially water. It can cause the lining to become inflamed as it attacks the mucous membrane lining. The acid of the stomach then forms an antral ulcer. An increase in the acid levels in the stomach may result in damage to the pyloric antral lining. This condition may be seen with the presence of tumors such as a gastrinoma. A gastrinoma tumor within the duodenum may cause excess acid to leak into the antral portion of the intestine. Stress, certain heredity disorders, alcohol abuse, tobacco use, and drinking excessive amounts of coffee can increase the acidity to dangerous levels. Regular use of pain relievers such as nonsteroidal anti-inflammatory drugs can damage or destroy the lining of the stomach. These common painkillers include ibuprofen and naproxen. The elderly are at a high risk for antral ulcers as a result of taking these medications on a regular basis. Knowing and recognizing the signs and symptoms of an antral ulcer can lead to preventing complications with an early treatment plan. A major effect of an antral ulcer is a critical tear or perforation in the protective lining of the stomach, which can cause the ulcer to worsen. An antral ulcer may expand or become inflamed when more damage occurs or if it becomes irritated. As a result, this can lead to possible obstruction of the digestive tract, which will hinder the movement of the food. If an antral ulcer condition worsens, the lesion may begin to bleed. This bleeding can cause you to become anemic or vomit blood. For a proper diagnosis, your doctor will note any symptoms you have experienced. You will be prescribed appropriate medications and may require diagnostic testing if symptoms do not improve. Blood, breath, and stool tests may be needed to determine if the underlying cause of the antral ulcer is a presence of an abnormally high level of H. pylori bacteria. If these tests show no definite cause of the condition, further testing will be done. These may include undergoing an endoscopy or the barium swallow test. Once a diagnosis is confirmed, treatment of the symptoms and underlying cause can begin. However, different conditions call for different treatments. An H. pylori infection is treated by targeting the pathogens causing the excess of bacteria. The goal is to stop the growth of the ulcer sore by destroying the cause. Antibiotics are used to cure the infection and may include amoxicillin, tetracycline, levofloxacin, metronidazole, or clarithromycin. 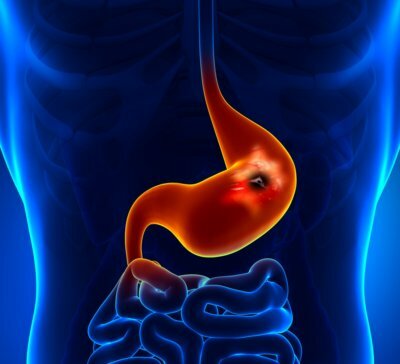 Excessive acid in the stomach is treated with prescribed proton pump inhibitors also known as acid inhibitors, which include omeprazole, rabeprazole, or lansoprazole. These are intended to target the stomach cells that are producing the excess acid. Histamine acid blockers are used to reduce extra acidity in the stomach. The doctor may recommend common over-the-counter products such as antacids to lessen the effects of stomach acid. These chewable pills give temporary relief of symptoms as they reduce the strength of the acid. Protecting the stomach lining from further damage may require the use cytoprotective medications. These may include misoprostol and sucralfate. In conjunction with the appropriate medicine, an antral ulcer may have a better success rate with lifestyle changes. Some antral ulcers take months and even years to heal. More serious cases may require surgical procedures although this is rare. However, surgery is seen with a ruptured antral ulcer. If you have been diagnosed with an antral ulcer, you should consume fresh fruits, vegetables, and nutrient-enriched foods as part of your healthy diet. It is recommended to eat six small meals throughout the day. Consume foods high in vitamins, minerals, carbohydrates, and protein to help heal open sores within the stomach. Incorporate foods with probiotics such as cheese and yogurt to regulate the acid levels in the stomach. Consume foods high in fiber such as flaxseed, whole grains, peas, and beans. Avoid consuming acidic foods such as citrus fruits and tomatoes. Choose low-fat or fat-free products and limit your daily intake to less than four servings. Limit your intake of cloves, onions, cinnamon, and garlic to avoid irritating the stomach lining. Avoid triggers such as fried and spicy foods as chili, red, and black pepper can cause inflammation of the antral ulcer. Avoid products known to damage or destroy the stomach lining like caffeinated foods and drinks such as cocoa, coffee, tea, energy drinks, dark-colored sodas, and chocolate. These should be limited or avoided. An antral ulcer can be a painful stomach condition that may limit your daily activities in severe cases but is a manageable and treatable illness. It can see damage to the lining of the lower stomach, characterized by an internal small open sore. The inflammation leading to such an ulcer may be caused by excess stomach acid, infections, and the overuse of regular pain relievers. Antral ulcer symptoms can be mild to severe with bloody waste products and a burning sensation in the stomach. Treatment usually includes medication with strict dietary measures. It is important to avoid antral ulcer triggers that can cause more damage. Antral ulcers may take a longer time to heal than other commonly-known peptic ulcers. “What is Antral Ulcer & How is it Treated?” ePain Assist, May 3, 2017; https://www.epainassist.com/abdominal-pain/stomach/what-is-antral-ulcer-and-how-is-it-treated, last accessed July 28, 2017. Uddin, R., “Symptoms Of Antral Ulcers,” Livestrong, June 21, 2015; http://www.livestrong.com/article/237459-symptoms-of-antral-ulcers/, last accessed July 28, 2017. Marks, D., “Diets For Antral Ulcers,” Livestrong, January 28, 2015; http://www.livestrong.com/article/517451-diets-for-antral-ulcers/, last accessed July 28, 2017.